One of the most important deities of ancient Egypt, Osiris was god of the underworld and judge of the dead. 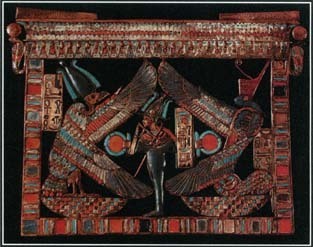 He also represented the idea of renewal and rebirth in the afterlife. Osiris appears in many Egyptian myths and legends, and his cult spread beyond Egypt. Little is known about the origin of Osiris in Egyptian mythology. In very ancient times, he may have been a local god of the city of Busiris in Lower Egypt. It is possible that he was originally an underworld or fertility deity or a legendary hero. By about 2400 B . C ., his cult had become firmly established and began to spread throughout much of Egypt. In Egyptian mythology, Osiris was the son of the sky goddess Nut and the earth god Geb, brother and husband of Isis* and father of Horus. He supposedly served as a ruler of early Egypt, where his followers honored him as both god and man. Credited with civilizing the country, Osiris introduced agriculture and various crafts, established laws, and taught Egyptians how to worship the gods. Osiris, the Egyptian god of the underworld and the judge of the dead, stands in the center of this piece of jewelry. plotted with others to kill him. They built a beautifully decorated box, tricked Osiris into getting into it, sealed the box, and then threw it into the Nile River. The box floated into the Mediterranean Sea and to the land of Byblos in Phoenicia*. Overcome with grief at the loss of her husband, Isis searched high and low for his body Eventually she found it. Bringing the body back to Egypt, she magically restored Osiris to life long enough to conceive a son, Horus. Isis then hid the body in a secluded spot. Set discovered it, cut it into pieces, and scattered them throughout Egypt. Isis gathered up the pieces, reassembled them, and restored Osiris to life once again. Instead of staying on earth, he chose to become lord of the Egyptian underworld. As king of the dead, he sat in judgment of dead souls, measuring the worth of their lives and determining their punishment or reward. The gods Anubis and Thoth assisted him. In his role as god of the dead, Osiris became associated with the Egyptian practices of embalming and mummification and was the object of intense worship. When Osiris became lord of the underworld, his son Horus became ruler of Egypt. The Egyptians believed that when a pharaoh, or king, died, he became the god Osiris. The new pharaoh represented Horus, the god of the living. In ancient Egyptian art, Osiris is usually portrayed as a bearded king wrapped in cloth like a mummy. He generally wears the crown of Upper Egypt, has an amulet around his neck, and holds a crook and a flail, symbols of his powers as god of fertility and the underworld. Although Osiris's main cult center was at the city of Abydos, the god was worshiped intensely throughout Egypt. The appeal of a god who offered the promise of life after death was so strong that worship of Osiris also spread to other parts of the ancient world, most notably Greece and Rome. See also Afterlife ; Anubis ; Book of the Dead, The ; Egyptian Mythology ; Horus ; Isis ; Nut ; RΑ (RE) ; Set ; Thoth ; Underworld .